Baby Naeva was 10 weeks at our photo session. She was so adorable and the center of love in the house, even her furry four legged sisters love her! My favorite thing is to capture a new family in their own setting just doing what they do. These small things are what make up the biggest and most important parts of our lives. Congratulations to this new family! A great sense of love for your Valentines day. Have a wonderful weekend everyone! Baby Naeva from JoyMoody on Vimeo. Amber and Bill are getting married on New Years Eve this year. Its sure to be quite the celebration. 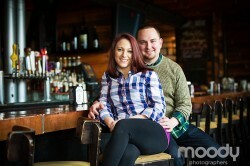 We met up in West Philly at the City Tap House for their engagement session. They spent a lot of time early in their relationship there and it holds a special place in their hearts. (We also had brunch there after our shoot and it was delish!) We also visited their old apartment building where they lived together for the first time. It was a great trip down memory lane. Bill’s son Xavier also joined us, he provided much entertainment and laughs. This was our last wedding in 2014 and it was a great way to end the year! Lisa and Phillip had an amazing day, they looked stunning and we had the perfect brisk fall day. It is always great to see all the hard work and planning couples go through all come together so beautifully. I had so much fun with the girls at the hotel before the wedding, such a great relaxed portrait session! The ceremony at St. Timothy’s Church was beautiful and we had a great time with the bridal party in Old City for pictures afterwards. This was my first time at Vie, its a beautiful venue. The Cescaphe Event Group does a splendid job. They earned some extra points for us as photographers as well by making us a special plate of food from cocktail hour as requested from Lisa. We are always in need of fuel when cocktail hour starts and it was just something small to make a big impact on our experience as photographers there that day. So thanks Lisa and Chescaphe!! This was such an amazing wedding to end the year with, congratulations to you and your families. Lisa & Phillip from JoyMoody on Vimeo.